Well, hey there! It's me. Can we talk hair color? See my nice silver sideburns growing in? This photo was taken at the end of December after about three weeks of no color. It's hard to tell but there was about 1/2 inch of gray all over my head at my roots. Creative combing. I've been covering my gray since I was about 23. Which means I've been coloring my hair for more than 20 YEARS. Almost 25! I can't tell you how tired I am of it. And the last few years in order to keep the brunette illusion I've had to intervene with either all-over color or touching up roots every two weeks. Dumping smelly chemicals on my head every two weeks doesn't seem like a great idea. So I made a big decision in December (a big decision in Frivolous Beautyland at least). My silver hair wins. I'm going to embrace it. No more squeezy tubes of color and plastic gloves for me. I'm going gray! This decision feels so right. I can't tell you how happy I am to never have to purchase a box of Espresso brown EVER AGAIN. On the other hand. I feel like I'm violating some universal female pledge to do what I must to look younger at all costs. My wonderful, diplomatic, seldom negative mom says I won't like it. She may well be right. Gray hair might be a large blow to my vanity. I'm going to have to look at myself in a whole new way. My big sister is also very skeptical. But she kindly went with me to get some highlights to help with the transition right after Christmas. Because. Y'all. I'm not getting a pixie cut. And I can't just let it grow in cold turkey and have a skunk stripe for months. I DRAW THE LINE THERE. Post highlight picture! OK, so I asked for gray highlights. Hmmmmm. These look blonde to me. Right? However, it has softened the effect of the gray growing in very nicely, I think. So far. We'll see how it goes over the next few weeks. Next time I go for a touch up I'm going to ask if it's possible to get truly gray/silver looking highlights with a glaze or something. That certainly seems to be possible, judging by the number of twenty-somethings on Pinterest sporting 'granny hair'. My plan is to keep going every couple of months for probably the next year or two for these highlight touch ups so that my new gray hair blends with my old colored-to-death hair, and then at some point I'm going to chop off the colored ends and be left with my au naturel hair. I'm pretty curious just how much gray I do have. It's hard to tell until it grows in more. But I think it's a lot. I have a Going Gray Pinterest board under construction if you'd like to be inspired! This lovely young lady is a great encourager. Wish me luck. It's going to be a rough hair year. I keep telling myself when my silver streaks are grown in I can try occasionally dyeing some of them lavender and be really hip and cool*. Can't do that with brunette hair. *Possibly using the old school words 'hip' and 'cool' make me inherently unhip and uncool but you know what I mean. Oh, Sandra, you are so hip! (Coming from a very cool mid-50's mama here.) I've dealt with the horrid grays too for a long time and color every 4-5 weeks to keep me looking "young". It's a PITA! I'll have to think about this, but I may just join you on this adventure. You can do it! Larissa, Larissa, Larissa...sorry I called you Sandra! No worries, Kathy, I'll just call you Samantha and it will be like we have secret code names! :0) Good luck with your to gray or not to gray dilemma! I was ready. You are very brave! Go, girl! And enjoy the process! I'm not sure it qualifies as brave if you compare it to getting off the gunboat at Normandy, but it's definitely something. ;-) I'll TRY to enjoy this. The rubber will meet the road after a couple more months, I think. Good for you! I started greying in my early 30's and never colored my hair. I'm a dark ash blonde, and my husband liked the silvery streaks, so I left it. I didn't want to become a slave to the color appointment; I knew I'd get sick of that pretty fast. I'm now in my mid-40's, with lots of silver. My belief about greying is that it's nature's way of toning down our coloring as we age to make us *more* attractive, not less. Colors of make-up and clothing we could wear in our 20's can look harsh in our 40's+. Nature does our hair for us... and we dye it! :O) Best wishes with your journey to grey. You'll be beautiful. Silver hair and dark eyes is the best look! You were smart never to start, Honeybee! I love the way you put this. My mom's silver locks are so much more flattering on her than the nondescipt tan color she was getting at the salon. Love your hair going natural...there is such depth and texture. I have been gray for 20 years (currently 51). "Gray hair is a crown of glory, the sign of a righteous life" proverbs....the righteous life always makes me chuckle. Be who you are Larissa. There is nothing wrong with silver. I'm 62 and I have grey in my sideburns, and whisps of grey throughout and still have my brunette hair to compliment the grey. It's who I am. On the plus side, I'm so happy that you are getting away from those chemicals. They are so bad no matter how they change the formulas. Just be Larissa and don't sweat the silver... I love that picture of Jamie Lee Curtis and her pixie cut, it's so flattering on women as we age. Looks good. You do not have wrinkles yet. That is super fun. Rosemary, who says I have no wrinkles? It's all about the lighting, baby. :-) I love my long hair because then I can twist it on top of my head and done. I have embraced my salt and pepper hair too - i get a few blond/silvery highlights added to mine now to blend in the regrowth. Nothing wrong with that! Getting the occasional low light and highlight is way easier and less maintenance than battling my roots. I started losing the mucky blonde colour in my hair at 60 and was doing the streak thing but it was costly. Then decided Id earned the damned silver grey so grew all the colour out and found I was silver at the front and gun metal grey/black at the back - but not in any artistically, pleasing way LOL I stuck with it for 4 years until I realised that not only was there a bloody old womans face in my mirror - but that she had no colour at all around her face! She was to all intents and purposes - invisible. So I have taken to the wash in and out, supposed to last 24 hair washes variety. Your streaks look absolutely great! Yours is so bright and fabulous with your blue eyes, Wendi! I love it. Congrats on making a decision about coloring your hair. Twenty months ago I made the same decision while sitting in my stylist's chair, preparing for another round of color. 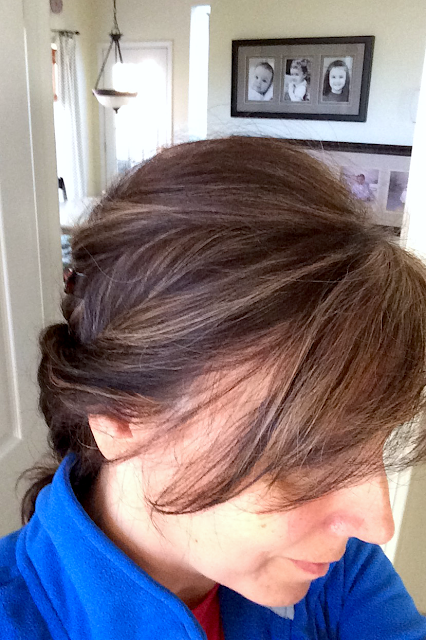 I was 51 and had been coloring my hair for two decades, ashamed of my silver streaks. I thought about my mother, who in her early 70s, was still coloring. In a moment of clarity I decided "No more!" and haven't regretted it. I used to wear my hair just below my shoulders but when I had four inches of gray, I cut it. I now sport a salt-and-pepper pixie and like it very much. I sometimes wonder if I should grow my hair longer or wear it in a different style but I NEVER wonder about coloring. There is something very freeing about embracing who you are. You mentioned your mother and sister being doubtful. Do they color? My mother, who is still coloring, loves my natural hair and now sometimes thinks of taking the plunge herself. I wish you luck and support on your journey!! Hey, Siobhan, wow you were IN THE CHAIR and had an epiphany! YES, my mom didn't stop coloring until she was 80 years old. 80! I was looking into my future and saw another 35 years of coloring and I was like NO EVER-LOVIN WAY. It made me want to just cry thinking of coloring for that much longer. It's going to be awesome never to worry about roots showing ever again. My sister is 9 years my senior and has different coloring so her stylist is giving her ash blonde highlights and lowlights to manage her gray hair. It's more forgiving to maintain than her brunette but she's not ready to go gray just yet. I'm going to end up looking older than my older sisters. 😳 a true blow to my vanity! LOL Thank you! I doubt that you'll look older than your sister. As we age, our skin lightens as it thins. That's why dyed hair can look so harsh on older women. I think it's part of God's design... graying hair and lover's eyes that see a little less perfectly. He softens our appearance to help us look our best as we continue on life's journey. I'm sure that you'll look beautiful with your changing color. You're beautiful anyway! BTW, I'm finding that hairstyle has a big impact on looking like a "granny" or not. If you keep your hair in a current style, no matter the length, it helps you look "younger". Lost my hair during chemo a few years ago and decided to go au natural when it grew back. I'm just happy to have hair again, but it's a mindset - maybe a sign of self acceptance or the confidence to not worry about what we perceive as societal pressure? I actually really like the greys, and so does my husband. I think you'll look fabulous. P.S. up to the colly bird in the 12 Days Series. Love sewing these. Your instructions are the best I've come across. yeah!! I think you're doing the right thing. Be authentic! I'm naturally grey and happy! Ya ya! Thanks, Jane! Silver sisterhood. I love this solution! You're going to look fabulous. Well, you always look fabulous, but it will this will be in a Sarah Harris/British Vogue kind of way. Can't wait to see updates! Go for it!!! I am 63 and have never colored my brown hair except for blonde highlights when I was younger. My gray hair has blended in nicely with my brown hair and I love it! Hey, Jules, you took the smart way! It's going to be hard for me to get used to seeing gray but that's the goal. I want to love it! you could try using one of those purple toned shampoos for blonde hair, that may help keep the highlights from going brassy and keep the cool tones. Hey, Lucykate, YES, I just found out about those from Robyn. I'm afraid to use one until I talk with my stylist but that sounds like a great fix! Yay for you! I've been going grey since college, but I've never dyed it -- so much I'd rather spend all that time and money on! I had my now 9 year old son at 39. I am a strawberry blonde going gray. Definitely more forgiving in the transition than dark hair. Having been called my son's grandma several times in his life including by some of his classmates, I do sometimes think about doing something. I can handle it. I just hope my son can. I just recently did this! I have to tell you, and I kid you not, I get compliments every time I go out and about. I have complete strangers constantly coming up to me telling me how pretty my hair is and how much they love it. Embrace the grey! It's in! 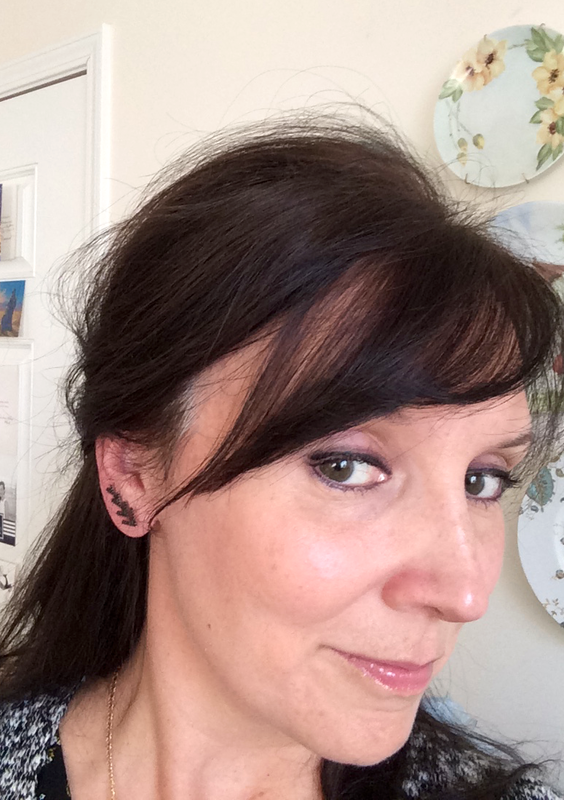 I'm 43 years old and am loving the freedom of not dying my hair which I've also done for years and years as I started to go grey in my early twenties as well. This is really encouraging, Rachel. Actually I've received several compliments on my hair lately so I'll take that as a good sign! :-) I'm LOVING not dying my hair! I'm 40 and have been allowing the grays to come in as they will for the past 6 years. My "gray" hair is actually so white it looks clear. Most people don't even notice my gray hair because of that, but I think that it lightens my overall hair color (I'm a brunette). The highlights look lovely. If you wanted an overall color you could go with a demi-permanent color. Wow, it's clear? That's pretty cool. Thanks re: highlights! I want to avoid demi-permanent if I can, just because it's another maintenance headache, because of the roots. I was dying my hair for many years starting back in the late 70's. I was working as a casher for Rite Aid back then. One day while putting new boxes of hair dye on the shelves, I decided to change my mousy brown hair to reddish blonde. I kept it that color for many, many years, especially after the gray started to grow in. I have 2 daughters, and my youngest (age 52) started to get grays at 17, she inherited that from her father. My oldest daughter (age 55) didn't get grays until much later. I decided to stop dying my hair about 6yrs. ago after my hubby & I celebrated our 50th Anniversary. I had began to get sores on my scalp from the dye, cause so many years they had ammonia in the dye. Now my hair is all gray and starting to turn white on top. I don't mind that cause I'll be 75 in April. It's all a part of life. Hey, SiChiang, thanks for this perspective! wow, 17 years old for your daughter! That's so young. I'm sure your gray looks fabulous!